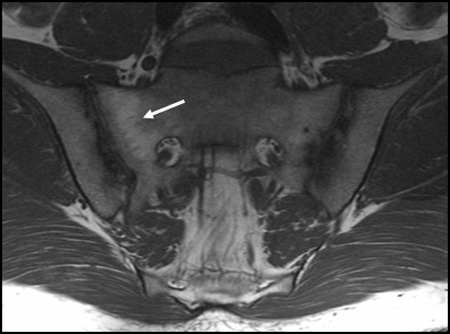 MRI is superior to radiography for detecting early sacroiliitis because MRI can show active inflammation before the occurrence of structural damage. MRI also visualises structural changes in the form of erosion and joint space alteration in addition to fatty deposition in the bone marrow. MRI is therefore appropriate for measuring the disease activity as well as chronic changes and can be used to monitor the disease with regard to indication for treatment and for assessing the effect of therapy. Early stage: Signs of disease activity in the form of oedema and/or contrast enhancement in the joint space and surrounding bone. The changes are often bilateral, but may be unilateral and vary from side to side over time. There are often accompanying chronic changes in the form of erosion, joint space alteration and fatty deposition in bone marrow at the first examination. Middle stage: Is often dominated by chronic changes (erosion, joint space alteration in the form of narrowing or widening and fatty deposition in the bone marrow). During active stages the chronic changes are mixed with signs of activity (oedema and/or contrast enhancement), which can vary from side to side. Late stage: Increasing joint destruction with partial or complete fusion (ankylosis) of the joints, which can appear as "ghost joints" (ankylosis with visible joint contours). 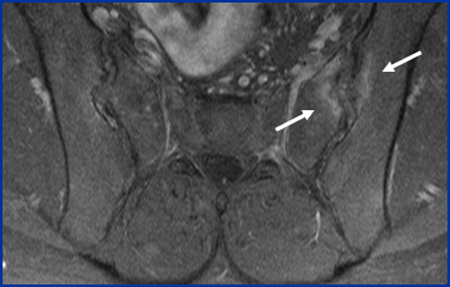 Semi-coronal STIR sequence showing signs of disease activity in the form of oedema (increased signal intensity) in the bone marrow around the distal part of the joints, most pronounced on the left side (arrows). Semi-coronal T1 fat-suppressed (FS) image after administration of contrast agent shows enhancement in some of the areas with increased water content on the STIR image as a sign of vascularised inflammation (arrows). The visualisation of pato-anatomical details is better than on the STIR image. It becomes clear that part of the inflammation occurs around the erosion, which shows scattered enhancement. 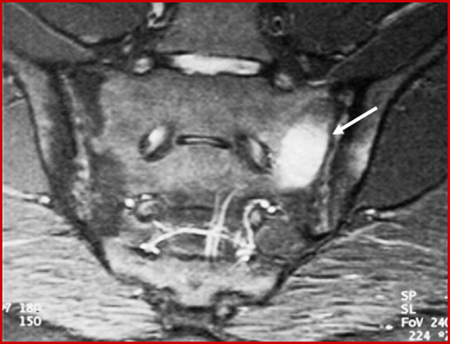 Semi-axial T1 FS image after administration of contrast agent shows that the changes are limited to the anterior cartilaginous portion of the joint (arrows). There is no inflammation corresponding to the posterior part with large ligaments. 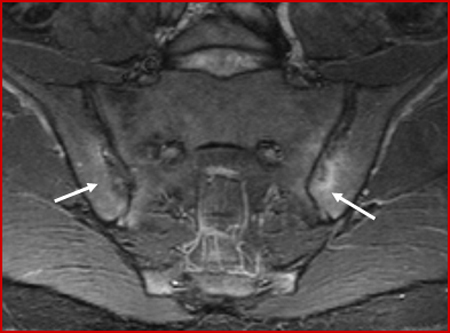 Semi-coronal T1 FS sequence showing obvious erosion of both joints (arrows). 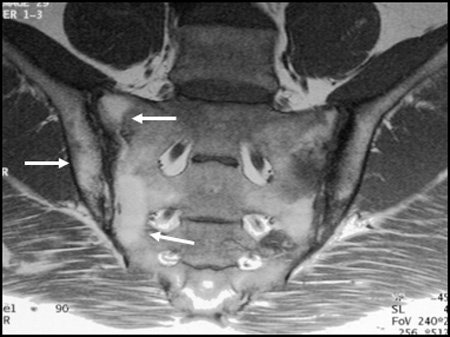 Semi-coronal T1-weighted sequence shows accompanying fatty deposition in the bone marrow most pronounced at the sacral side of the joints (arrow), which is characteristic for ankylosing spondylitis. 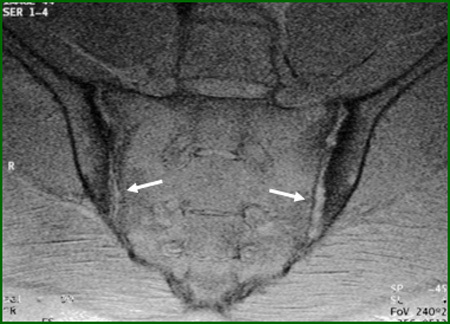 T1-weighted semi-coronal sequence shows fatty deposition in the bone marrow beneath the joint facets (arrows) as a sign of sequels of inflammation. In addition, irregular joint facets and joint spaces. 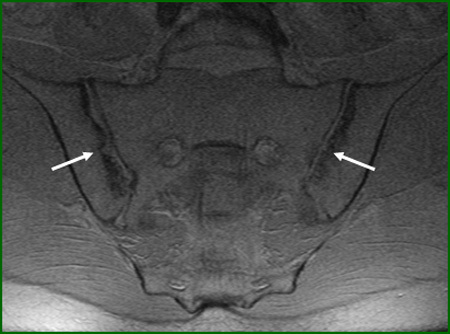 Semi-coronal T1 FS image more clearly visualises erosion of the joint facets and joint space alteration with areas of widening (arrows). 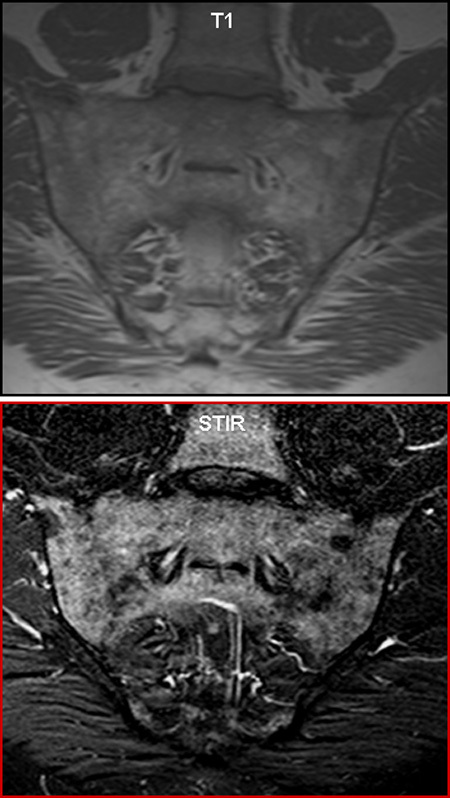 Semi-coronal STIR image shows additional signs of activity corresponding to the left sacroiliac joint (arrow). 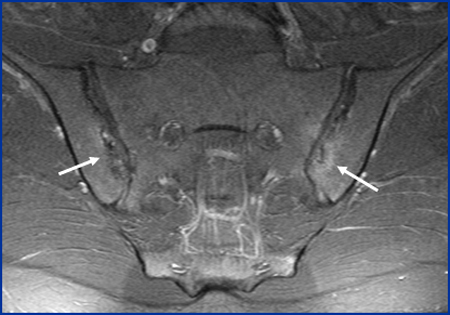 Late stage showing ankylosis of the joints, but with visible “joint contours” on both the semi-coronal T1 and STIR sequence (ghost joints).